I’ll be honest with you. I’ve never been an overly athletic person. Or even moderately athletic. When they were handing out co-ordination skills up there, I think I must have been taking a nap. I never played much sport as a kid – I took a ballet lesson once (singular) and played tennis for a couple of seasons but I don’t recall being fantastic at either. But despite my terrible athletic history, when I got the chance to try Powerhooping, I jumped at it. Sure I was never much good at hula hooping as a kid either, but how hard could it be, right? I arrived at Lloyd Elsmore Netball Centre on a Monday evening after work full of excitement and nerves. I followed the crowd indoors, each person carrying their own brightly coloured Powerhoop. As I entered the building, I found myself in the midst of a bunch of cheerful and enthusiastic women. As I glanced around the room at people already confidently hooping, I wondered if I’d make a giant mistake. Our lovely hoop instructor, Kerrie, put my nerves at ease as she demonstrated the correct way to hoop. Right leg forward, swing hoop in opposite direction, move body gently back and forward. Easy enough, I thought. After a couple of attempts, I could hoop pretty smoothly (in one direction at least) and I was feeling confident. 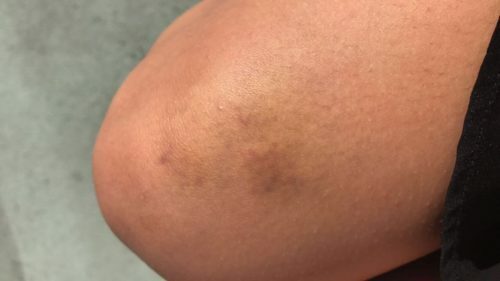 By the end of the warm up, my arms were aching and from the number of times I’d already dropped my hoop, I could feel the beginning of what would become serious bruising around my abdomen and thighs. As the rest of the class hooped smoothly and confidently, the moves got more and more complex. Gentle swaying developed into side to side steps, back and forward with arm movements to match. Then there was the unexpected wall sits, squats and kicks that had my leg muscles burning while overhead shoulder presses got my severely weak arm muscles working. Pretending I’m a professional – fake it ’til you make it? By the time class wrapped up 45 minutes later, I was filled with endorphins and left class on a high, promising to return another day. I had no idea of the pain to come. The effects of the next day were minimal – that was until I tried to get dressed. I quickly learnt jeans were a bad choice as my abdomen was bruised in at least 10 different places. I’m told it gets better after a few more lessons – although I’m yet to be brave enough to test that theory! OVERALL: Probably the most I’ve ever enjoyed any form of exercise. 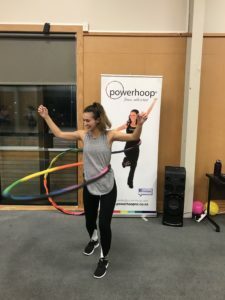 No matter what your coordination levels, if you’re looking for a super fun way to get in shape with a supportive crew of people, I would fully recommend checking out a PowerhoopNZ class! Check out http://powerhoopnz.co.nz/ for more information on the benefits of Powerhooping and to find a class near you! Next articleNew addition to the family, Welcome on board, Ron and more!